The press love to take the piss out of him but cant live without him. Warner wanted shot of him and now must be begging for his return for Prince has hit the jackpot in Vegas. Lets take a look what has happened since Prince entered the dreaded ‘abyss’ of independence – he is winning Grammy’s, headlining award ceremonies, selling out his $125 – $315 tickets at his purpose built club 3121 in Vegas, hitting number 1 in the album charts, performing to 140 million spectators at the Super Bowl, out-grossing any other touring artist in the US, getting inducted in to the US and UK Halls of Fame and picking up awards everywhere else. Not bad for someone who walked out from the suits of the music industry a decade ago. So what happened to cause his renaissance? A myriad of reasons. The once reclusive Prince can’t get enough of the media which is good considering he is now a draw to them now rather than a figure of fun. 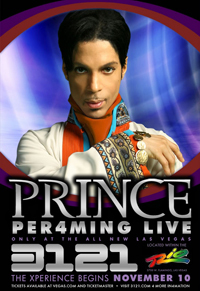 Many believed the Musicology Tour of 2004 would be their first or last chance to see Prince perform his hits after much talk of him retiring this-and-that song off. Was Prince changing, yes, but for the better, and that was what surprised us all. The tickets for that tour were inexpensive and the arenas on its 96-dates were filled. 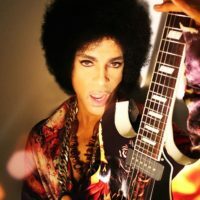 The Musicology album itself was surprisingly radio-friendly and went multi-platinum, his first album to do so since 1996. Fans who had left the fold were returning. The follow-up album, 3121, was even better received by critics and fans alike, it charted straight to number 1, his first album to do so since Batman in 1989. A few choice TV appearances later and Prince was firmly back in the hearts and minds of commercialism, the public and the music industry once again. The secret is, that the marketing of Prince should be left to himself rather than confused record labels. So now the man has set up camp in Las Vegas, re-branding the failed Club Rio of the Rio Hotel Casino into Club 3121. Not only is he packing out the venue, he is also the talk of the town, the shot in the arm Vegas was craving. No one knows who needed the other the most, whether it were the Rio Hotel or Prince, or both, or how long his stint will last for, but we do know the partnership and timing is sheer perfection and as long as Prince is happy and the Rio gets people the people flowing into their off-Strip hotel, the shows will undoubtedly exist for some time to come. Even Vegas admits he is no ordinary ‘past-it’ Vegas act such as Elvis and Sinatra. Prince is still re-writing the rules and as long as he does he will continue to endure, weather he chooses to or not is down to him, a third successful album in a row will show his commitment to that. ‘If you build it, they will come’, why? Because in a world of ever-diminishing musical talents, it is the legends we all turn to.